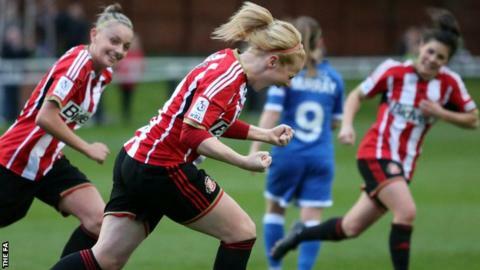 Rachel Furness scored the winner as Sunderland clinched their first Women's Super League One home win and extended Bristol Academy's losing start to six matches. Angharad James put the visitors ahead in the ninth minutes with Bristol's first goal from open play this season. Victoria Williams went close and Beth Mead's header hit the bar in response. Brooke Chaplen met a Mead cut-back to level before Furness headed in Victoria Greenwell's free-kick. The closest the Vixens went to adding a second after the break was when Rachael Laws tipped a stray clearance from Keira Ramshaw over the bar. Defeat at the Hetton Centre leaves Bristol bottom of WSL 1 and extends a miserable run, which saw them go out of the Champions League, FA Cup and concede 20 goals before travelling to the north east. "If you asked us at the start of the season after playing Liverpool, Manchester City and Bristol how many points we would have had I don't think we would have said six. "We aim to get as many points as we can and we've had a great start and hopefully we can take that into the next game. "I don't think we were brilliant but we did dominate the game." "We're still positive. We know that good things will happen. "It will take time, we've got a completely different team this year, a completely different squad and we are playing a completely different way. "In the first half we competed, but in the second half we went missing. I don't know what happened. We just dropped the intensity and it wasn't a good half from myself and the team." Sunderland Ladies: Laws, Holmes, Bannon (c), Sharp, V Williams, Furness, McFadden (McDougall 81), Chaplen, Joice (Greenwell 68), Ramshaw, Mead. Substitutes: Harkness, Bass, McDougall, Kelly, Gutteridge, Wilson. Bristol Academy: Earps, Dykes, Matthews, McCatty (c), Lawrence, Ladd, Murray, Watts, Ingle, James, Fantom-Brown (Bird 87). Substitutes not used: Passariello, A. Evans, G Evans, Dalton.